When considering professional home care for a senior loved one, family caregivers may have to sift through an overwhelming amount of information, making it difficult to know what is true and what isn’t. Where could family caregivers and seniors turn to decipher fact from fiction? Bayshore HealthCare has been helping Canadian seniors age happily at home for over 50 years, and we’ve heard every story imaginable, when it comes to professional care at home. Today, we’resome common home care myths to help give seniors and family caregivers what they need to know, as they start their home care research. Myth 1: A family member is the best person to care for an aging loved one. While aging seniors can always benefit from the love and help of a family member, professional caregivers can help fill in the gaps left by limited availability and burnout. Members of the sandwich generation are faced with the unique challenge of caring for aging parents with children still living at home. Many family caregivers will find that a little extra help from professional caregivers can offer them peace of mind, knowing their aging loved one is in capable hands. Plus, Bayshore offers in-home medical care from nurses, wound care specialists, therapists and more, so seniors can enjoy quality healthcare in the comfort of their own home. Myth 2: Home care is only for people who are sick. Seniors who are still in good health and have a few challenges around the house may find that aging at home is the best option for them.. For a little company and assistance, Bayshore’s Companions are ideal to ensure happihness at home while helping out with meal prep, shopping, housekeeping, and more. Seniors could build a meaningful connection with their caregiver all while enjoying the security of an extra helping hand. Myth 3: Introducing home care means an aging loved one will lose their independence. In reality, in-home care enables independence and freedom for both seniors and their loved ones. With trusted assistance for housekeeping tasks, seniors can live confidently with more time and energy to focus on hobbies, community activities and grandchildren. Seniors with health challenges don’t have to worry about medication schedules, wound care and other healthcare needs, when Bayshore’s caregivers are there to assist. Myth 4: Home care isn’t meant to be a long-term solution. Bayshore’s home care services are actually designed to assist seniors in the long term. For immediate help after a surgery or hospitalization, we can be there for the transition home from the hospital. 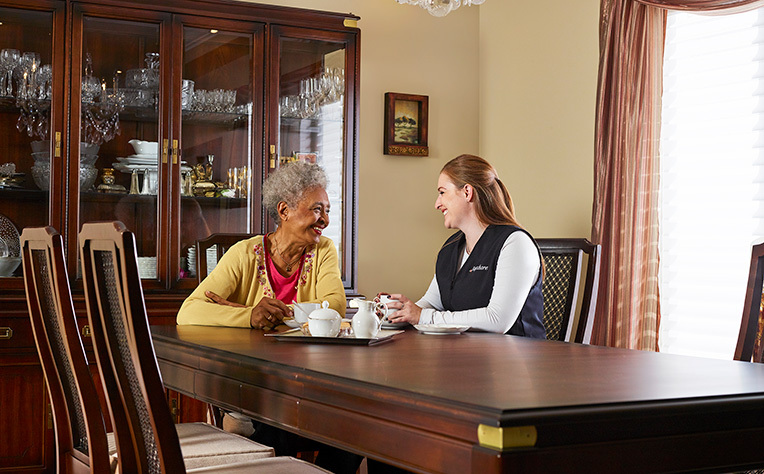 If a senior falls ill or suffers an injury, our nurses can step in to help with the healing process at home; and once they’ve recovered, Bayshore can assess the home for fall risks and dangers, further ensuring long-term safety. Bayshore can assist seniors through every stage of aging; even end-of-life, with our integrated palliative care approach to maintain dignity and comfort. Myth 5: Seniors with dementia and Alzheimer’s aren’t good candidates for home care. Bayshore offers specialized care for seniors who live with dementia and Alzheimer’s at home. Our caregivers are trained to care for those diagnosed, offering peace of mind to family caregivers and reducing safety risks in the home. Seniors living with Alzheimer’s can have an engaging and fulfilling life, especially at home with the right care and support. The addition of professional home care can ease the impact of the disease on seniors and their loved ones.